The obscenities that took place during the First World War were well recorded. Observers on both sides of the Western Front trenches and the countless other killing fields saw the reality of the bloodbath that the working-class and peasantry were dragged into – by ideological deception or the force of law. The ruling class response was to counter the revulsion against War with resurrection of militarist mystification shrouded in patriotism - the “last refuge of the scoundrel” . 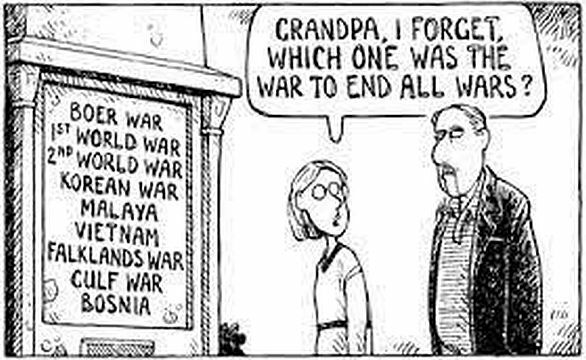 The truth is that the war was a direct result of capitalism in its imperialist phase. Nationalism was/is just its ideological cover. The ideology has grown and developed into a solemn celebration of British imperialism – incorporating glorification of every British military action during the last hundred years and reaching its pinnacle each year around “Poppy Day”. The British bourgeoisie emerged as part of the winning alliance when the Armistice came into effect in November 1918 but they were confronted by the international Revolutionary wave that was already challenging the global capitalist order. The recognition of the challenge was exemplified when the King was persuaded that he would be foolish to allow his cousin, the deposed Tsar, to find refuge in Britain. During May and June 1917 30,000 or more war-weary French soldiers in 54 divisions refused to fight. Inspired by the Russian Revolution, they called instead for “Peace or Revolution”. But less well-known are whole number of mutinies involving British soldiers that took place including major actions at Etaples and Boulogne late in 1917. These actions accelerated during 1918 and 1919. One source summarises the situation in 1919 as follows - In January 1919 there was a tidal wave of mutinies at Southwick, Folkestone, Dover, Osterley Park, Shortlands, Westerham Hill, Felixstowe, Grove Park, Shoreham, Briston, Aldershot, Kempton Park, Southampton, Maidstone, Blackpool, Park Royal, Chatham, Fairlop and Biggin Hill, as well as at several London railway stations where troops refused to embark for Russia and France. On 3 January 1919, virtually the entire garrison at Folkestone refused to attend reveille in protest at poor food, excessive officer privileges and orders that they return to France. At a huge demonstration, 10,000-strong, the troops voted to form a Soldiers’ Union. The link between the mutinies, strikes and the revolutionary wave became even clearer in the period immediately following the November 1918 Armistice. In 1919, in Kinmel Bay, North Wales, Canadian soldiers mutinied, demanding return to Canada and resisting any move to force them into the Imperialist interventions against Soviet Russia. Key players in the mutiny, subsequently murdered by the military, openly declared solidarity with proletarian revolution. In 1920, dockers in London refused to load the ship “Jolly George” with arms destined for the counter-revolutionary armies in Russia. During the war there had also been an upsurge in class struggle in workplaces and working class communities. These moves were met by imprisonment of “leaders” and widespread repression by the British state. Prominent in those attempts at state repression in favour of “the war effort” were Labour Party representatives such as Arthur Henderson, a Cabinet Minister in the coalition government. Henderson was far from unique amongst Labour politicians who were totally in favour of the war. For example, in Barrow, where strikes took place in the Munitions factories during 1916 and 1917, the strikes were opposed by the local Labour M.P., Charles Duncan. The Marxist understanding of Imperialism as period of ongoing bloodshed was immediately acted out by the British State after the Armistice. They made sure that the “guns did not fall silent”. As early as April 1919 the British Indian army opened fire on a mixed group of unarmed protestors and religious pilgrims in what became known Jallianwala Bagh or Amritsar Massacre. The Imperial authorities admitted to murdering 379 people while the Indian National Congress estimated the slaughter at around 1,000. In Ireland, 1919 saw the start of two and a half years of brutally violent military actions by the British armed forces. In Britain despite the repression, the experience of class struggle and organisation during the war flowed into further strikes and militant working class struggles around social conditions that continued into the 1920s. In common with moves across the world, in Britain many of the militants involved in the working class struggles that had taken place during the War rallied to the banner of the international revolution raised by the October revolution in Russia. Not so the British ruling class which invaded Russia in an attempt to safeguard its investments and overthrow soviet power. The British invasion was a bit of a fiasco and came to an end In 1920 soon after dockers refused to load the Jolly George with supplies bound for the forces of intervention. By 1921 it was clear that class struggle remained a “spectre that haunted the British bourgeoisie” . It was not until 1926 that the British State, with the active connivance of the Trades Unions leadership, was able to decisively defeat the working class during and after the General Strike. However, the ruling class had patiently prepared their assault on class militancy. Part of their ideological preparation was the boosting of ideas such as National Unity and patriotic duty. The developing “Pomp and Ceremony” around the annual minute’s silence on 11th November was part of that effort to destroy the working class’s consciousness of the possibility of a better world. The origins of “Poppy Day” are part of that capitalist counter offensive. The reality that the War was ended amidst strikes, revolutions and mutinies and that an end to the capitalist order was both possible and necessary was replaced with concepts around patriotism, support for the state and established order and the benefits of maintaining armed forces under state control for use at home or abroad. The Haig Fund, which started the annual sale of poppies – donations to ease the burden on state finances of supporting discharged fighters – started in 1921. With nauseating complacency, the ruling class felt able to name the initiative after Douglas Haig, who had commanded the British Army on the Western Front from 1915 until the end of the war. To illustrate Haig’s role during the war, we can quote 2 sources neither of whom are friends of proletarian revolution. The Canada War Museum (www.warmuseum.ca) summarise that “His … costly offensives at the Somme (1916) and Passchendaele (1917) have become nearly synonymous with the carnage and futility of First World War battles.” This is substantiated by the military historian, B.H. Liddell Hart, who is quoted on the Historynet web site, “He [Haig] was a man of supreme egoism and utter lack of scruple—who, to his overweening ambition, sacrificed hundreds of thousands of men”. Since the first “Poppy Day” the Imperialist world system has steamrollered forward generating war after war and avoidable disaster after avoidable disaster. In Britain, since 1960 the developing technical nature of warfare meant that conscription was no longer the best way to feed the military mincing machine. Instead the British armed forces have depended on paying volunteer recruits. Without a doubt, at the bottom end of the structures many of the “Boys from the Mersey and the Thames and the Tyne” (Oliver’s Army, Elvis Costello) were effectively economic conscripts as the chances of stable traditional, adequately paid wage slavery became increasingly scarce. At the end of their “service” the returning working class soldiers are welcomed back to the reality of the bosses’ system. They face virtual abandonment and often end up homeless or in mental institutions. Rates of suicide are understandably disproportionately high. They are utterly expendable with many having to depend on charities for support for themselves and their families. That in turn, has linked with the rolling back of generalised working class consciousness and combativity. The other side of that ideological defeat is shown very clearly around November 11th every year. Every sporting event is now prefaced with a ceremony as part of the nationalist carnival. The UK Football Associations insist that teams wear the Poppy emblem despite supposed bans on political symbols. Individuals such as the Irish international, James McClean, who refuse to take part are vilified, abused and attacked (birminghammail.co.uk). In many workplaces, the poppies are sold in such a way that refusal is seen as a “deviant” behaviour. The bosses, with the complicity of Trades Unions where present, organise the “minute’s silence” enforcing participation in the spectacle. It is clear that all the main broadcasters exercise influence on their employees and those appearing in interviews etc. to wear the poppy. Politicians of all parties also play their part in carnival celebrating the established order. How appropriate that Jeremy Corbyn and his close acolytes maintain the Labourist tradition of national class collaboration dating back to the First World War. In every city, town and village ceremonies are held with past, present or future members of the armed forces where patriotic duty is extolled and we are all asked to think of those who made the “ultimate sacrifice”. What is absolutely drowned out amidst the bugle calls, national flags and militarist ceremonies is any thought of how, why and in who’s interests so many millions have been killed or had their bodies and minds wrecked. The unthinking commitment to the national flag and acceptance that “national interest” is the central guide to activity is a poison that the working class is forced to drink. It is part of the schematic of lies and delusions that helps them to maintain their power and control over the great majority – those whose work produces all wealth. Embedded in that nationalist mumbo-jumbo is the mystification that somehow those who, by accident of birth, are born of one nation are intrinsically different from those born a few miles away. Such nonsense is apparent even to liberals lacking any understanding of class society. Unfortunately, the material needs of the capitalist system means that the horrors unleashed by nationalism – not just war but the whole range of racism and xenophobia – are prices well worth paying to keep the working class confused and divided. Socialists, on the other hand have always seen that the overthrow of capitalism is the essential bridge to ending war and genocide. In one of a chain of coffee bars today, you might hear the toaster sounding blip-blip-blip-bleep, as per the dit-dit-dit-dah of morse code, which reminds me of Archangel, to which the British Expeditionary Force were sent from as from 1918 to 1920, at which my grandfather was a telegraphist. He told me that they used to sing 'When Irish eyes are smiling", but ending it with ".and we say Dosvidania, which in Russian means goodbye!" (Actually I believe it means 'God be with you'.). He returned safely, but with bronchitis. My grandmother blamed that on his going to watch rugby, but he would say, "No, church my dear !". Also a telegraphist from Plymouth, she went stone deaf resulting from scarlet fever. so if they were in a group conversation, my grandad would tap morse code on his knee, and she would 'read' it from across the room, and of course no one else knew what he was telling her ! Which might bring us back to today's media ?! Circumstances always have and aways will influence the views of people of all classes, but a background of various political and other sorts of beliefs can cause apparent confirmation or modification or rejection of incoming propaganda. In today's world, the output of the media, owned and controlled by imperialist governments and private capitalist organisations, is immense and largely overwhelming, generating compliance or acquiescence in bourgois ideology in broadcasters and journalists, listeners and viewers, with some exceptions. The impressive article and quotation from Rosa Luxemburg is inspiring, but what scope can there now be for an extent of anti- imperialist propaganda of sufficient volume and intelligently acceptable content to persuade workers against what we are given to understand by and about the capitalist class ? It is exceptionally hard to persuade workers of any nation to refuse to join up in armed forces when threats of war escalate, and news leaks through of what is or has been going on in, for instance, concentration camps. Looking back to WW2 can cause all sorts of mixed views, hopefully not re-runs. I keep thinking that surely now there is enough technical knowledge and raw materials for us to be able to turn this planet into a paradise, but first we need to get hold of it. "...the bloodbath that the working-class and peasantry were dragged into..." I am sorry to burst your bubble but members of the aristocracy, bourgeois and petty bourgeois were also dragged into the slaughter. I think that the mass demonstrations in rejection of inter-bourgeois war in 2003 demonstrates that the working class worldwide are no longer to be kowtowed as it has in previous generations. These overwhelmingly peaceful demonstrations failed to evert the imperialist wars so the workig class resorted to violent demonstrations of its antipathy to capital, concentrated in the period 2008-2011. These violent demonstrations were snuffed out by the effective world war in Syria. The ball is now in the court of the working class. I'm sorry to burst your bubble but the bourgeoisie and aristocracy started the terror by killing Moscow workers (who has surrendered to them when promised safety) in cold blood. In a class war you have to choose sides. After years of class retreat the movements of 2008-11 were welcome but they were not specifically working class and the Syrian example illustrates just how far the ruling class in any state will go to preserve their hold on power and hence their property. The working class still needs an autonomous revolutionary movement to begin the challenge to the system. We are helping to stir things up towards it but we (the working class as a whole) have a long way to go yet. The continued contradictions of system long past its sell-by date are what gives us the material basis for recognising that such a response will come one day. It’s very hard to work out what importance you attach to that comment about the First World War. 2) The bourgeoisie and aristocracy weren’t actually “dragged into the slaughter”. They started and ran it. 3) It was the workers and, same qualification as above, peasants who ended the War through strikes, Mutinies, revolutions and in the case of peasants, land seizures. Just to be clear, my comment is in reply to Jim Katz’s first comment timed at 10:48 today. Despite my own and all other comments on this article, the main question must surely be what now ? That's a very short question KLZ but certainly well worth discussing. A hlunt version of an answer is that the ruling class will try to maintain their system of exploitaion which encompasses the planet and can only result in ecological destruction and bloodshed, repression and/or impoverishment for the vast majority of humanity. The optimistic bit is that a "better world is possible" - a "free association of producers" / Communism. Of course, we then hit a big problem that the necessary crucial step is the self-emancipation of the working class. That in turns depends on a much deeper and wider spread of class consciousness than exists at preset. That deepening class consiousness comes from workers engaging in struggles in their own interests and drawing lessons from their own and the rest of the struggles by the workng class. Trying to foster illusions in any shortcuts only deepens confusion and erodes proletarian class consciousness even further. For the ICT, who provide this web site and many written publications, we believe that Communists have a primary duty to retain, develop and explain the realities of the development and nature of capitalist society and the possibility of its replacement with a socialist world based on need rather than profit. This is not an exercise in sitting in ivory towers as we are nothing other than a part of the working class. It is only through interacting with the class, particlarly when sections are in struggle, that we can enrich revolutionary understanding and encourage other militants towards the Comunist movement. That is why part of the "what now" is particularly working with the many militants across the globe who are discovering the viability of a "Left Communist" approach distinct from the various varieties of "statism" that misappropriated the title of Socialism and Communism many years ago. We actively encourage such militants, whether individuals or already involved wih organised nucleii, to work with us to increase our involvement and roots within the class. OK Schless, that's useful. Now please can we consider the best way and/or ways in which approaches to workers on strike are to be made. I guess it's hardly practicable to attempt, just by word of mouth, to explain the entire main points of ICT views as soon as strikers are met. Maybe leaflets with CWO views on the specific strike would be a way of 'approaching' several strikers at a time. I recommend that they should be printed in much larger font than has been used on Auroras and RPs, because being confronted with vast amounts of reading matter, no matter how explicit, is not everyone's cup of tea. Presumably many workers read tabloids because it doesn't take up too much time, and subheadings are helpful. Also, a problem with one particular daily paper (which I won't name herein) is that it has very large headings, often couched in various colours, at the expense of comparatively very small font main text, which is very off-putting in itself, irrespective of 'pearls' intended to be issued. Then, what are the leaflets,or just verbal approaches, going to advise and ask striking workers to do ? Be conscious of the world capitalist situation ? Form a workers' council ? Subscribe to CWO publications ? And or what ? In the current stage when there are few struggles going (and we don't just mean strikes) our first approach is to go and talk to those in struggle and listen. Then we can see where they are and where they intend to go but we all the time encourage the struggle to develop autonomous forms which are not controlled by any organisation with a vested interest in defending the system or some aspect of it. After that we may distribute a short leaflet (like the one to the Durham TAs a couple of weeks back and on this site) and those that are interested then get Aurora (they often ask us for it). In a wider movement of course we can get more ambitious but that's our starting point. KLZ - Just to add to the Editor's reply. Workers' Councils are not on the agenda at present but it is possible to argue for the practicalities of proletarian organisation e.g. open meetings / assemblies run by and open to all engaged in struggle. Any committee/delegates have to be answerabe to the mass meetings and recallable. Specific struggles have posed, and will continue to, questions of how best to control "from below", for example how to resist the efforts of our opponents to sidetrack the strggle into meetings of a few "behind closed doors". Where militants enage with us then naturally we try to explain our political views and encourage further reading and discussion. That certainly includes being honest about the limits of any partial/sectoral struggles in the current circumstances where even the most hard-fought gains are temporary and fragile, subject to being snatched back as soon as the struggle ebbs. Thank you for your response and for all that you and comrades have done and are now doing. One advance I've made - perhaps the only one ! - is that I havc discovered how to print off ICT articles using a larger font size than had seemed fixed on my printer, some of which I've sent to contacts. Snag is that printer ink cartridges keep getting more expensive. In a paper mill I once learnt that before putting some of a ream of paper into a printer, because the guilloting tends to make sheets stick together, it is best to rest it and/or the amount you intend to use, on your open hand, put your thumb on top and roll it a bit, which has the effect of separating each sheet by a millimeter or so, then holding the lot up and gently tapping it level again on a flat surface, which should enable pages to feed smoothly through the printer. Apologies to all readers already familiar with all this. Cheers. What does the CWO have to say about republicanism here in England ? We are steadily being told by the meda that homelessness is steadily growing. So how many palaces does the monarchy need ? Answer: none, if the soap-opera media-bolstered situation is resolved ! Then we are told that there is a great shortage of nurses and doctors. Cuba managed to train many doctors and sent many to work in other lands. If the vast amounts of money spent on monarchic imperialist palaver were to be spent on what society in England actually needs, an all-round healthier prospect shouild emerge. Of course the CWO wants to abolish money anyway, but at present the problem is that of how to get what there already is, but not yet available for the well-being of the majority of us. Bringing in nurses from abroad to fill the gaps, when there are already sufficient funds, but not accessed, to train English workers, is absurd. The monarchy will be swept aside with the rest of the capitalist system and communism will be a republic of some sort (but that is a rather poor definition for something that will be much richer than past republics). Many republicans today are not anto-capitalist (just anti-monarchy). Cuba's doctors being sent abroad was a bit like North Korean workers being sent to Eastern Europe - they were part of the state's imperialist policy (doctors for oil in the case of Venezuela and the doctors did not have real choices). However what you say is internally incoherent. If there are funds available to train nurses that are not currently used then abolishing the monarchy would not be necessary (even if pleasant to perceive) so the problem lies elsewhere. Well I note your comment, but as for mine being 'internally incoherent', I had not intended to argue that only funding for the monarchy would be needed to pay for the training of nurses and doctors in the UK. Also, the issue of any justifications to entitlements to palaces could be examined well before an acquirement of a republic, as the latter, within the ruling ideology of one of the oldest centres of imperialism, is likely to take some time to be in place, whilst homeless grows now.. I don't know of North Korean workers being sent to Eastern Europe; maybe you might to inform us about that ? Whether such a scenario has any likeness or relevance to Cuban doctors being sent abroad seems to stretch CWO-type views even further than usual.